You'll be £24.99 closer to your next £10.00 credit when you purchase Memoirs of a Wartime Interpreter. What's this? On May 2,1945, Red Army soldiers broke into Hitler’s bunker. Rzhevskaya, a young military interpreter, was with them. Almost accidentally the Soviet military found the charred remains of Hitler and Eva Braun. They also found key documents: Bormann's notes, the diaries of Goebbels and letters of Magda Goebbels. Rzhevskaya was entrusted with the proof of Hitler’s death: his teeth wrenched from his corpse by a pathologist hours earlier. The teeth were given to Rzhevskaya because they believed male agents were more likely to get drunk on Victory Day, blurt out the secret and lose the evidence. She interrogated Hitler's dentist's assistant who confirmed the teeth were his. 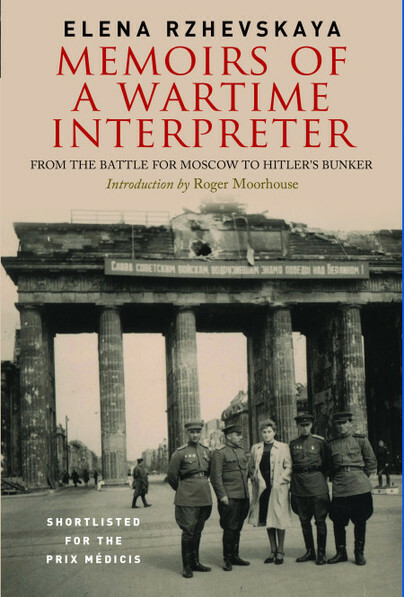 Elena’s role as an interpreter allowed her to forge a link between the Soviet troops and the Germans. She also witnessed the civilian tragedy perpetrated by the Soviets. The book includes her diary material and later additions, including conversations with Zhukov, letters of pathologist Shkaravsky, who led the autopsy, and a new Preface written by Rzhevskaya for the English language edition. Rzhevskaya writes about the key historical events and everyday life in her own inimitable style. She talks in depth of human suffering, of bittersweet victory, of an author's responsibility, of strange laws of memory and unresolved feeling of guilt. As a witness to this Russian scramble to identify Hitler, Rzhevskaya, whose account is published for the first time in English, is excellent. Unadorned, clear-eyed, precise, she describes how Russian investigators tracked down Hitler’s dental surgery, then the dental nurser who saw to Hitler and Braun’s teeth…. It Is a remarkable, filmic story, crisply told. This is an astonishing first-hand account: a must-read. A RUSSIAN interpreter's incredible mission to keep Hitler's teeth safely in a box in the days after his death has been told in English for the first time.